Discussion in 'Cold Cases' started by OkieGranny, May 12, 2016. "After the vehicle stopped, the suspect who followed her over there approached the car, reached in, may have put it in park, but definitely took something out of that car," Wachter said. "When he was finished, he got into a white BMW, exited the parking lot southbound on York Road and turned left onto Walker Avenue." The body of Joann E. "Jody" LeCornu was discovered in her white Honda Civic after a delivery crew at the plaza's Giant food store reported hearing gunshots at 3:41 a.m. Baltimore County police say Ms. LeCornu's purse was not in the car, leading them to suspect robbery as a motive, said Capt. Brian Uppercue. Steve Dubin, her boyfriend and housemate... did not get home until about 12:30 a.m. Saturday. He said Ms. LeCornu probably got off work about 5:30 p.m. Friday. When he realized she wasn't home, he said he assumed she was visiting her parents in Annapolis. Her father is John LeCornu, an Anne Arundel County assistant state's attorney. "The boyfriend hasn't provided us with a lot, her friends don't know where she was," Captain Uppercue said. Finger prints were lifted from inside and outside of LeCornu&#8217;s car. Initial record checks of the fingerprints were negative. Those prints are now going to be re-checked to see if there are any matches. Detectives believe that the suspect would not have been able to keep the incident to himself. Over the past 20 years they believe that he likely told someone about it. Baltimore County Police are releasing pictures from the crime scene hoping to jog the memories of potential witnesses. The snowy images are being made public for the first time. Police say, while sitting in her car, LeCournu died from a bullet to the back. Police released a dramatic picture that shows how it traveled through her seat. Investigators also released a picture of a white BMW that's similar to the suspect's vehicle. Bollinger tells PEOPLE investigators have re-entered the fingerprints they'd recovered from LeCornu's car into the nation's criminal database, hopeful they'll get a hit after all these years. He has also been conducting fresh interviews with several persons of interest who've been connected to the case. He's also talking to LeCornu's friends and ex-boyfriends again. "We're also trying to develop DNA off of some of the items we'd collected from the scene where previously, we couldn't," says Bollinger. "We are going over video taken at the time, using new technologies. Our video examiners are now able to take apart a video and retract an image from it where you couldn't do that 20 years ago. We're just going back to see if we can shake the tree and get any apples to fall." I was just reading about her case. I feel like if we knew why she was in that parking lot at 4a, we'd know why she was killed and by whom. Can anyone (local) fill us in a bit more on the background of this case? Twenty-one years after her death, the fatal shooting of Jody LeCornu remains unsolved. The mysterious cold case over who killed the 23-year-old Towson University student is now turning into a legal battle for control of the police investigative file. This case is testing the boundaries of the Maryland Public Information Act with court papers disclosing Baltimore County polices reluctance and resistance to cooperate on any every level. Court filings reveal a contentious legal fight resorting to name calling and accusations of unprofessional conduct. 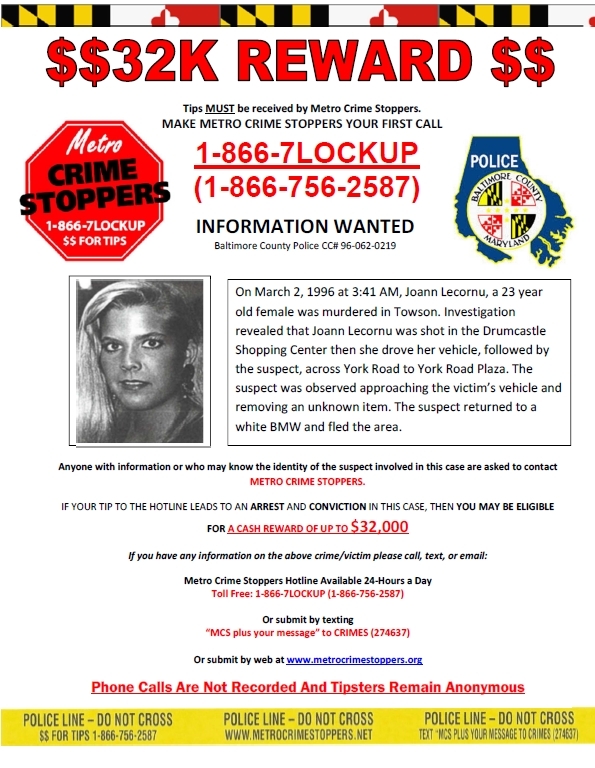 At issue is whether Baltimore County police should turn over its 21-year-old cold case file to the family of LeCornu, who was shot to death March 2, 1996. We just want to find out what happened to Jody and to do this battle, its slowly killing me inside, Jenny Carrieri, LeCornus identical twin sister, said. Carrieri is suing Baltimore County police to get the case file and hand it over to a private investigator..."
"The Baltimore County Police Department is still investigating the 1996 murder of Jody LeCornu, who was killed in Towson. Her twin sister, Jenny, describes what is known of the murder scene in an effort to renew interest in the case. (Lloyd Fox, Baltimore Sun video)"
We were contacted by Jody LeCornu's sister Jenny Carrieri. Jenny asked for help in the 21-year-old cold case of her sister's murder. When you start digging in you will soon feel the frustration Jenny has felt all these years. Things got so bad that Jenny actually is suing the Baltimore County PD. Jenny is going to be a guest on tonight's Websleuths Radio (Tuesday March 7th). The show airs at 8:00 PM Eastern TONIGHT. After we speak with Sheryl McCollum about the Abby Williams and Libby German murders Jenny will be our guest. Here are some articles and other media to help you catch up. You'll find the police have a video of the alleged killer, the type of car he was driving, witnesses, fingerprints, more videos from surrounding businesses, it is just nuts this hasn't been solved by now. Jenny is now a verified member of Websleuths and will be joining in this discussion in the coming weeks. Her user-name? JennyCarrieri. Please Welcome Jenny to Websleuths. 21 years is too long for Jody's loved ones. Thank you in advance for your help with Jody's case. PS This thread will open as soon later today after Jenny makes her first post. Below is a message from Jenny. She will be posting later in the case. Don't forget tonight Jenny will be on Websleuths Radio to discuss her sister's murder. "Hello, my name is Jenny Carrieri. I have been talking to Trish and I'm reaching out for your help. My identical twin sister, Jody was murdered March 2, 1996, on my parents wedding anniversary, in Baltimore, Maryland in the Caldor parking lot on York RD. My father prosecuted violent crime and drug cases and has since died of cancer. Jody and her boyfriend had gotten into a fight that morning and he told her not to come home. She went to work at her job at the bank. Then she went to the Mount Washington Tavern and stayed till closing time. After driving an employee home, she drove to the parking lot and sat and made several phone calls. One of the phone calls was back to the bar. It was snowing that night. Everything Jody did that night was out of character. She had a lot of anxiety and she never would've driven in the snow, driven somebody home she didn't know or gone to sit in a dark parking lot. Witnesses saw a black male in a white BMW approach her vehicle. Her window was rolled down and there was some sort of communication and as she drove away he shot her. She was able to drive across a 5 lane Rd. into a larger parking lot where the giant 24 hour food store was. The bullet had gone into the back of her car and into her back and severed her spine. She was able to drive a little bit longer and she circled the parking lot and he stayed at the top and watched her. Shortly after, she came to a stop, I believe after hitting a curb. He drove over to her with witnesses around and reached in over her body, put her car in park and took something out of her car and got into his car and took a right on York Road. There are witnesses, fingerprints, suspects and four videos from that night. The Baltimore County Police Department have mishandled her case. They have lied to me, contradicted themselves, not followed up on leads, been inappropriate and disrespectful. I filed an MPIA (Maryland public information act) request for her file. They denied my request. Now, I am in the process of suing Baltimore County and Baltimore County Police Department for her case file. They are fighting me every way they can. They are trying to dismiss my case. She died on the Baltimore County/ Baltimore city line. I've had Baltimore city please reach out to try to help with her case and Baltimore County denied their help. Please help in any way you can with her case. Here to help, if I can. Where are the checks and balances with regard to a police department's misconduct? Is there a way to escalate this case beyond the Baltimore County Police department? Jenny Carrieri and the LeCornu family deserve justice! Tricia's radio interview was very good and is a good stating point to become familiar with the case. Also, just watched all of the videos posted above. enlightening. They all give you a very good overview of the case so far. Just MOO here but it seems like LE in Baltimore have a lot to work with. How awful to lose Jody in such a cruel manner and then have to go through all of this to try and get justice for her.